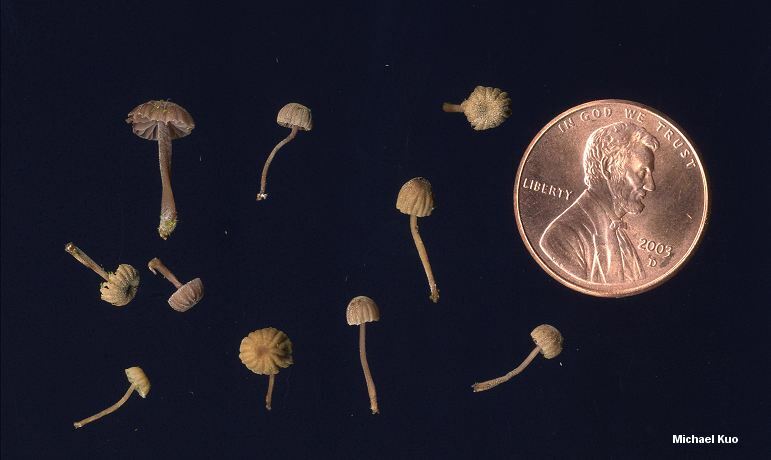 Mycena corticola is a gorgeous little mushroom, common in eastern North America but rarely noticed by collectors since a specimen measuring a centimeter across is a virtual Goliath. Like most species of Mycena it is a wood rotting saprobe--but it thrives on bark rather than wood. As a result it is only found on fallen wood early in the decomposition process, when the bark is still attached--or, quite frequently, on the bark of standing trees. In the latter case Mycena corticola is probably harmless to the tree, like Aleurodiscus oakesii, since its mycelium does not invade the crucial water-conducting phloem or sapwood beneath the bark. 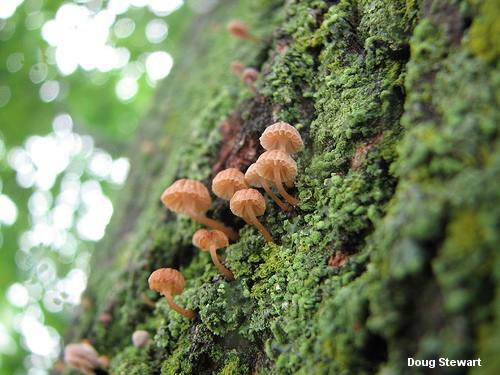 Recognizing Mycena corticola is a bit of a challenge, but its bark habitat helps limit the number of look-alikes. 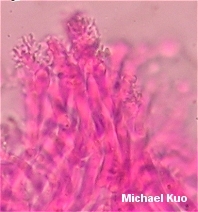 Physical features include a white spore print; purplish brown colors that quickly fade to brown, orangish brown, or paler; a dense coating of extremely tiny pale granules (best seen with a hand lens when the mushroom is young); a cap that soon becomes pleated; and microscopic features (see below). Like species of Marasmius, Mycena corticola is "marcescent" and has the ability to shrivel up in dry conditions and then come back to life with the next rain. Mycena pseudocorticola is virtually identical, but features a bluish gray to gray cap. 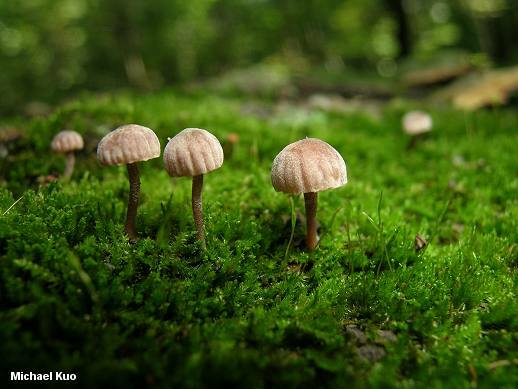 Mycena meliigena is (probably) a synonym, and is the name some European authors prefer. 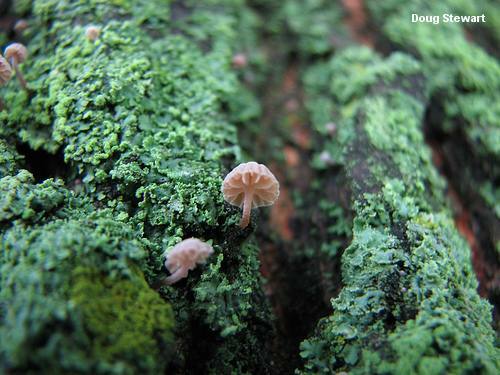 Thanks to Doug Stewart for collecting, documenting, and preserving Mycena corticola for study; his collection is deposited in The Herbarium of Michael Kuo. Ecology: Saprobic on the bark of standing or fallen trees, usually with moss present; frequently found on oaks but also on the bark of other hardwoods or conifers; growing scattered or densely gregariously; late summer and fall, but sometimes appearing in spring; widely distributed from the Great Plains eastward. Cap: Up to 1 cm across but usually 3-5 mm; convex, becoming broadly convex; dry; becoming pleated; densely covered with tiny, pale fibrils and granules (use a hand lens) that may begin to disappear with maturity; purple-brown when young but soon fading to brown, orangish brown, or tan. Gills: Attached to the stem or beginning to run down it; distant; colored like the cap. Stem: Up to 1 cm long and under 1 mm thick; fragile; equal; covered with fibrils like those on the cap (densely so when young, creating a pale surface); colored like the cap. 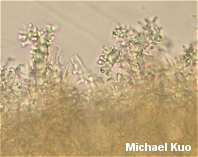 Microscopic Features: Spores 9-11 µ; round or nearly so; smooth; amyloid. Pleurocystidia absent. Cheilocystidia abundant; 26-33 µ long; clavate; with tiny bumps or, frequently, with fingerlike projections. Pileocystidia and caulocystidia irregular, densely covered with simple or branched nodules and projections. REFERENCES: (Persoon, 1801) Gray, 1821. (Fries, 1821; Kauffman, 1918; Smith, 1947; Breitenbach & Kränzlin, 1991; McNeil, 2006.) Herb. Kuo 06109605, 09210501, 09270501, 08150601.